Thanks for having this information available. I just wanted to ask… Is it really necessary to reduce the speed limit to 35?!!! I feel that 35mph is WAY too slow for that road. When we reduced the speed limit from 45 to 40 how did that effect accidents….. Was there any reduction in fatalities?!!!! Once Sagamore Phase 2 construction is complete, the road will be re-posted to its original 40-mph speed limit. Are there projected timelines for completing each phase of this project? Sagamore Phase 1 has an estimated July 2017 construction completion date. Sagamore Phase 2 is on schedule for construction completion by September 2016. Sagamore Phase 3 is estimated to be constructed by December 2018. Question for the design team – Did the design consider where snow from plowing operations would go and how much of it would cover the sidewalks? And then how would the sidewalks be cleared of snow? Especially at 1:42 in the video, there is not much room for snow to be plowed to the sides of the road…and once the snow is plowed onto the sidewalk, where is the individual/company/organization/gov’t supposed to put the snow to “reopen” the sidewalk? Or are the sidewalks shut down during the winter time? The majority of the Sagamore Phase 2 corridor slopes toward the center of the road, to the center median rain gardens. As a result, roadway snow should also be plowed to the center. Sidewalk maintenance will be the responsibility of the adjacent property owner, in accordance with City ordinance. The new asphalt that appeared a few months ago made this road the smoothest it has ever been. Is it finished? Or, will it be destroyed to improve the drainage? 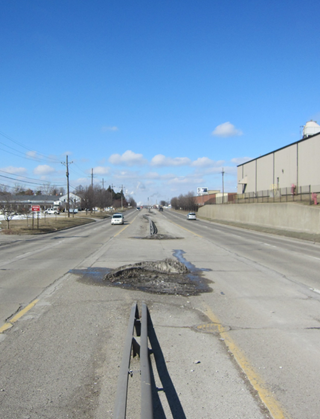 The asphalt overlay installed summer 2014 will be removed during the reconstruction of this section (Sagamore Phase 3). Sagamore Phase 3 is estimated to be constructed by December 2018. I think you need to consider some lane usage signage at the Union St intersection. SB traffic is using both the left turn lane and right turn/straight lane to go straight. Cars using the left turn lane to go straight block those that want to turn, then you have both lanes trying to merge into one. I’ve seen this at all times of day and weekends when there are only a couple of cars there. Some additional No Left Turn signs would be beneficial going northbound as well. Selfish people who need their McDonalds are blocking NB traffic and cause backups to 26. Anyway, just thought I’d throw those suggestions out there as a daily driver of that stretch. Thank you for your suggestions and informing us with what you have experienced. This information has been passed along to the field personnel for further investigation. What is being done now? Also what can we expect for the rest of April into May? As far as construction, traffic lanes, and Business availability. The contractor is currently installing water main and storm sewer south of Union Street along Sagamore Parkway. This work will continue through May. 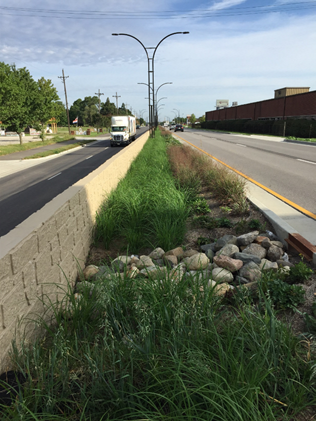 The month of May will also include retaining wall construction north of Union, and the installation of storm sewers between the Greenbush and Union intersections. Starting next week, northbound lanes will be closed from South St. to just north of the railroad tracks for 3-4weeks. Northbound traffic will be detoured at South Street to Creasy Lane, and returned to Sagamore Parkway via Union Street. Motorists can access businesses on the east side of the road, between Union Street and the railroad tracks, by traveling south of Union and turning left at designated locations. After the closure, traffic will be split to one northbound and one southbound travel lane (Phase III of the construction phasing) to accommodate work in the median. Access will be provided to business throughout the corridor. Left turns will continue to be restricted; motorists will need to plan their route accordingly. The stretch next to the wire company has a raised road. What is the purpose of this? Seems to be a lot of added cost. I am reading that the current road condition in front of Southwire is going to be that way through May. It doesn’t seem that it will actually be done by months end. Is there a new date for the projected end of that phase? Will the lane closures just flip flop lanes for the next phase? Per the latest schedule, traffic will be on the outside lanes until mid-July. At that time, traffic will be switched to two-way on the current southbound lanes in order to construct the northbound lanes. Will both north and south roads be raised? the concrete wall in the middle seems awfully high. Thank you for your question. Only the northbound lanes, just north of Union, will be raised. We encourage you to check out the fly through video located on the Home Page for a visual of this change. Will construction be halted for the winter? When will it resume.? Is the project on schedule? Thank you. Work will be suspended between the Christmas and New Year holidays. Depending on weather, construction will resume in January working on storm sewer items, pavement removal, common excavation and subgrade treatment in the southbound lanes. The project is currently on schedule; however, a harsh winter could potentially delay the project’s completion. Project completion is expected to be end of summer 2016. Why is Beech Rd. by Kirby Risk closed? Any idea when it will reopen? It’s become an inconvenience for Vinton Woods residents. Beech Rd. was closed in an effort to prevent Vinton Woods from becoming a detour route during construction. The road will be opened to traffic once the Railroad Company replaces the crossing at this location. This work is estimated to be completed this summer (2016). What is the projected timeline of the current Union Street closure? Will there be any other closures necessary before finalization of that section of the Restore Sagamore project (specifically at Union and Sagamore)? Union St. Is scheduled to be opened back up by April 8. No further closures are planned, at Union and Sagamore, only lane restrictions. Upcoming closures on Sagamore phase 2 include the closure of Sagamore at the Home Depot RR tracks for 1 week (Scheduled to begin April 11), the closure of the west approach of Greenbush for approximately one month (beginning April 18) and the closure of Sagamore from the Home Depot drive to the Speedway gas station (scheduled to begin mid May). When South bound Sagamore is closed on April 7th, will I still be able to cross sagamore at the SR 38 intersection to get on Main Street? When Sagamore Parkway southbound is closed on or after April 7, traffic will still be able to cross the SR 38/Main Street intersection, with the exception of a 3-week period of time around mid-May and another 3-week period of time later in the summer or early fall. These closures will allow for utility and storm sewer work on the Main Street approaches to Sagamore Parkway. Detour routes will be posted to this website in advance of the closures. Additionally, McCarty Lane will be limited to only eastbound local traffic between Main Street and Sagamore Parkway throughout the entire duration of the southbound Sagamore Parkway detour, which is why it is not being proposed for a detour route during the Main Street closure. How about McCarty? Will that crossing remain open? McCarty Lane will be one lane eastbound local traffic only (effectively closed) for the duration of the project between Main Street and Sagamore Parkway. East of Sagamore Pkwy, McCarty Lane will be open to two-way traffic until later this summer or early fall, when it will be reduced to only a single eastbound lane for approximately 45 days. How long will the intersection of Sagamore Parkway and McCarty Lane be closed to through traffic going from McCarty down to Main Street? I was wondering how long I need to avoid this route since I regularly take it. – Sagamore Parkway will be CLOSED in the southbound direction between Kossuth St and Teal Rd through Fall 2016. – The east approach of Main Street will be CLOSED for three weeks beginning in May. Additional signage and detour maps will be provided prior to this closure. – The east approach of McCarty Lane will be RESTRICTED to one eastbound lane east of Sagamore Parkway for 1.5 months beginning in early to mid-summer 2016. This restriction will not happen until after the east approach of Main Street is re-opened. Additional signage and detour maps will be provided prior to this restriction. – The west approach of Main Street will be CLOSED for three weeks beginning in the late summer 2016. Additional signage and detour maps will be provided prior to this closure. How do you get to Fast Eddies car wash? We encourage you to visit our detour map page for the latest information on closures and current detour routes. To access Fast Eddies this week (due to the Railroad’s closure) plan a route from the north (i.e. Union St., Greenbush St., etc.) and head south on Sagamore Parkway. This is a very important project and needs to be done. Why can’t the work be done with longer hours and in the evening to lessen the downtime of this important corridor of the city? Thank you for your question. Consideration of construction schedules is a balance of safety, cost, and efficiency. We agree that this project needed to be done and are glad (now that it is a local road) the City has the authority to restore it. When Sagamore was relinquished, the City was given a fixed amount of money to maintain and repair the road. We are trying to stretch those dollars and provide the City a better product to include: increased pavement reconstruction on major side streets thereby increasing intersection capacity, trail connections and safe pedestrian crossings to connect east Lafayette to downtown, decorative street lighting, landscaping and trees, water main reconstruction to failing sections of mains, and sewer reconstruction to reduce the amount of flow to the Combined Sewer Overflows. Longer hours and nighttime work come at a higher cost, from the Contractor, their subs and their suppliers. With the southbound closure from Union to Teal Rd, how long will the closure be AND will businesses on the west side be accessible from sagamore? Between Kossuth Street and Teal Road, Sagamore Parkway will be restricted to northbound traffic only from now until Fall 2016. Businesses on both the east and west side of Sagamore Parkway will be accessible at all times throughout construction. Since we are now into the month of May. When will in intersection of 38/Main St. & 52 be closed and for how long? Beginning Monday May 9th, the east approach of SR 38 will be closed for approximately 3 weeks. During this 3 week period, Sagamore Parkway will remain open to northbound traffic, and the west approach of Main Street will remain open to eastbound and westbound traffic. Could someone please explain to me why it seems as though areas of construction are up for so long? It appears that long stretches of time go by once a project begins where there is no work being done. If a section of road were to be worked on from start to finish, I would imagine the areas in question would only be closed for maybe half as long. Instead, it looks as though the cones/barrels go out, the road gets torn up, and then it sits for weeks or months while crews work in different areas. Why not just do a section at a time? Larger construction projects require several specialized crews and subcontractors to perform operations to build the road. Many times these operations cannot be done at the same time in the same area – one operation must be done before the next begins. This means one crew could be laying pipe on the south end, while a concrete crew could be pouring drives on the north end. The contractor has to schedule these crews to work on multiple projects throughout the construction season and they have to move in and out of a project depending on when they can begin work there, weather delays, equipment breakdowns, scheduling conflicts, etc. The more area the contractor has available to them to work at one time when they start an operation, the more efficient they can be. The more sections a project is broken down into, the more times the crews have to be scheduled to move in and out of the project – and ultimately the higher the cost to build the project. Additionally, safely maintaining traffic during construction is a large consideration. We try to establish the major traffic patterns that can be maintained for sustained periods of time, rather than changing them every couple of days and creating more confusion to the traveling public. While I’m still not thrilled that it means that roads are made one-lane or closed off altogether for longer, that makes sense. Is there just one of each specialized crew, then? Also, how is it decided which construction sites take priority? Are higher-traffic areas considered important to get done as quickly as possible, or are work hours for those (as well as considering which type of crew they’re ready for) scheduled to be done mainly during off-hours when there would be less potential hazard to the workers? The Contractor is responsible for coordinating and determining how many specialized crews and subs are necessary at any given time. It is everyone’s goal to get constructions zones and closures opened as soon as possible. We hope that this information can help with your understanding of the construction process going forward. Will there be a crosswalk at the Sagamore Parkway and Greenbush intersection? Yes; In an effort to connect existing sidewalks and trails, there will be a crosswalk on the west side of the intersection to cross Greenbush St. and on the south side of the intersection to cross Sagamore Pkwy. At this time, Sagamore Parkway, from Teal Road to Greenbush Street is estimated to be constructed by December 2018. Sagamore Phase 1: Teal Rd. to National Dr. is anticipated to be completed by July 2017. Sagamore Phase 3: National Dr. to South St. is anticipated to start construction spring 2017, with an estimated construction completion date of December 2018. Hi folks, can you all say more about the sidewalks, bicycle paths, and multi-use trails which will be included along Sagamore Parkway? I’m glad to see sidewalks, but there are plenty of places where wider trails could easily be included, and I’m wondering what’s planned. Thank you for your question. The Sagamore Parkway project is designed to comply with the City’s Master Bike & Pedestrian Plan: http://www.lafayettebikeandped.com/ The Bike & Pedestrian plan was developed through public surveys, open houses, public forums, and input from various committees comprised of local leaders of the healthcare, schools, bicycle, running, public transportation, etc. communities in the Greater Lafayette area. The Bike & Pedestrian considered safety, need, connectivity, costs, available Right-of-Way, to name a few. As a result, it was determined that sidewalk will be along both sides of Sagamore Parkway from Greenbush St. to Teal Rd. There will be a section of trail along the west side of Sagamore, south of Greenbush, which will run beside the new detention pond and connect into the bike lanes planned for Earl Ave. and Union St. Also, per the Master Bike & Pedestrian Plan, the major intersections of Sagamore will include median refuge islands to cross Sagamore Pkwy. What is the timeline for Phase 2 to be completed? It looks so close to being done. You are correct; Sagamore Phase 2 is almost done (Yay!). It is anticipated to be completed by THIS fall, September 2016.
when will kossuth to south st project begin? ?…how long to last?? Thank you for your inquiry. Sagamore Phase 3, from National Dr. to South St., is anticipated to start construction spring 2017. The construction completion date is currently estimated to be December 2018. I am just wondering when the Sagamore Railroad crossing is scheduled to reopen. The Sagamore Parkway closure, located at the Railroad tracks, will be OPENED on or before Wednesday, June 22nd. Thank you for your patience during this closure. As of today, July 12, can I drive north on Sagamore to Schuyler without any closures? The restoration looks great and I am glad to see the walking/biking paths! Yes; there are lane restrictions, but no closures. Thank you for your question and your kind feedback. How long will the Sagamore Parkway and State Road 38 intersection be closed? I went to work one morning that route and when I went home that night it was closed, with no warning or information of the closing. When will it reopen? The west leg of the Sagamore Parkway and Main Street (SR 38) intersection is scheduled to be closed for approximately three weeks, beginning on August 2. We strive to provide adequate advance warning of closures and traffic restrictions to drivers via multiple media outlets. Beginning two weeks prior to this closure, it was announced on the news and in the newspaper. It was also posted to the project website at the same time. Detour route maps were posted to the website and in the newspaper, as well as handed out to all businesses within the project limits. Please continue to visit the project website for updates on future restrictions and traffic pattern changes. My question has to do with the the street lights. Wha is the clear tubing in the center for? The last couple of day i have noticed that a couple of them across from Lewis Motors appeared to be light up. One night they were blue and the next they were green. The tubes in the pole will serve as decorative light, with the ability to change colors (as you witnessed). The City can use these poles to promote events and holidays, while creating a unique and inviting look to this important roadway and its businesses. Thank you for your question and your interest in this project. The lights are a distraction. They are at a level where they blend with the traffic signals making those important lights less visible, especially when the decorative lights are showing a hue that is close to the color of the traffic signals. Thank you for your comment. We have received others like it, and will take this feedback into consideration when selecting colors in the future. The purpose of the colored light tubes is to be a conversation piece, artwork, and an attraction to the corridor; but safety of our public remains our top priority. At this time, we are still working through some installation issues, which have resulted in a range of colors. Thank you for your comment and interest in the project. One of the goals of the project is to improve the ride quality of the road. The intersection of South St and Sagamore Pkwy will be reconstructed, and has been designed for a smoother crossing. In addition, thank you for your observation regarding the RxR tracks. We have seen your concern, and will improve this RxR crossing within the project scheduled for this year. While trees can be an obstacle, similar to street signs, fire hydrants, light poles, etc., they too serve positive purposes. The shade which trees provide helps preserve and prolong pavement life. In addition, they create safer walking environments by creating a more visible buffer. There have also been studies that reflect increased business and added property value on tree-scaped streets (they help with esthetics). City projects consider the proximity to the road, the type of adjacent road, how much space the tree has to grow, location of overhead power lines, and salt tolerance when determining the selected tree species. They are then spaced and planted in compliance with the City Ordinance. While the species selected along Sagamore are ones that grow narrow or tall enough that branches would clear traffic, the City will be responsible for trimming any unexpected street obstructions. Similarly, while the species selected have deep root systems, should an errant root heave the adjacent sidewalk the City will be responsible to repair the walkway to comply with accessibility standards. Why is there going to be a crosswalk in the middle of the block? That will only cause more traffic congestion and it gives pedestrians the impression that crossing the street in the middle of a block is acceptable when we should be persuading them to cross at intersections where it’s safer. Also, it’s not related to Sagamore specifically, but what’s with all of the new flashing yellow left turn arrows? The fixtures have more bulbs and must require more programming and then there is a sign needed as well to explain what the arrow means. Meanwhile, everyone already knows what a green circle in a left turn lane means; they had to know that in order to get their license. If there is any concern about confusion, maybe from drivers from out of state or something, wouldn’t it have been cheaper to just make the sign to explain the green circle rather than making a new light and a sign? The City considers the public safety of their motorists, bicyclists, transit users and pedestrians with every project. Sagamore is no longer a public highway, and is being restored to attract more patrons by car, bike, bus and foot, in compliance with their Master Bike & Ped Plan. City Bus will be adding a bus stop to the center of the block (between South St. and Kossuth St.), to accommodate the employees of the many businesses along the corridor. As a result, a HAWK pedestrian signal will be added at this proposed bus stop location. The signal will provide minimal disruption to traffic by only operating when a pedestrian is present, and will improve the safety of all at this designated crossing. The left turn arrow signal heads are being phased out (throughout the state of Indiana and throughout the country), to be replaced with the flashing yellow arrow signal heads. The flashing yellow arrow is known to minimize delay for motorists and enhance safety by reducing driver error. Just was wondering on the cost of the decorative lights along sagamore? Again, thank you for your question and for your interest in this project! Is that $11,000 per light fixture? What is the projected operating and maintenance cost of these lights in addition to the initial purchase price? Yes: $11,000 is the approximate cost, per lighting structure along Sagamore, to include: the pole, foundation, associated wiring, conduit, decorative tube lights and roadway luminaires. Thank you for your questions, and for bringing to “light” the advantage the selected LED Sagamore lights will have over the lifetime, when considering operating and maintenance costs in the coming years. Since traffic is detoured to Union and Creasy due to the closure of the Sagamore and South intersection, it seems that it would help reduce traffic backups on eastbound Union turning southbound onto Creasy if the “no turn on red” sign were removed and/or a green right turn arrow be placed there. It’s frustrating to sit in a long line of motionless vehicles knowing that they could be safely moving while the green left turn arrow is on for the westbound Union traffic. Thank you for considering! Thank you for your respectful idea to improve the detour route delay. Unfortunately, the eastbound right turn from Union onto Creasy has a sight distance problem (meaning that the motorist has an obstructed view within the required length of need, in order to perform a safe right turn); therefore, removing the sign and allowing this movement would create a safety concern. I think you have done a wonderful job with the Sagamore Parkway restoration. The plantings in the medians are beautiful. What are the grasses in the median close to Union and across from the old Essex Wire building? Thank you very much for your comments. We used several types of ornamental grasses throughout the project. We used ‘Cheyenne Sky’ Switchgrass and ‘Karl Forester’ Feather Reed Grass. I believe the grass you are referring to is the ‘Cheyenne Sky’ Switchgrass. The Latin name for this is Panicum Virgatum ‘Cheyenne Sky’. Why have the decorative lights been off between Union and Greenbush? I miss them! Thank you for your support of the decorative lights on Sagamore Parkway. Once the project is complete, they will be in place from Main Street all the way to Greenbush Street. Unfortunately, during the early deployment of the lights on the sections of the road that are already complete, we have run into some issues and we are working to resolve those issues by the time the overall construction project is finished next summer/fall. The controls of the decorative lights are complex and require a lot of coordination to ensure that they will function properly. Sorry – we miss them too! When will south st and sagamore be fixed I avoid it. The road is so rough on my tires. When will the lights be turned back on? Thank you for your questions and interest in the project. We are happy to announce that the intersection of South St. and Sagamore Pkwy is open!!! The roadway surface is now complete and smooth. However, there is still work being done in the area (to include pavement markings, landscaping, signals, etc. ), so please pay close attention to all traffic signs and delineators. This final phase of construction will wrap up this fall, and the center tube lights are scheduled to be in operation upon completion. Kiara Nicole Mendez on Restore Sagamore! Craig R on Restore Sagamore!